So Sai Baba himself shows here yet again what he has always denied, that he accept goods from others! But that is glaringly obvious anyhow by all the riches he freely disposes over, not least the palace-like apartments he is ever building for himself with other people's money. 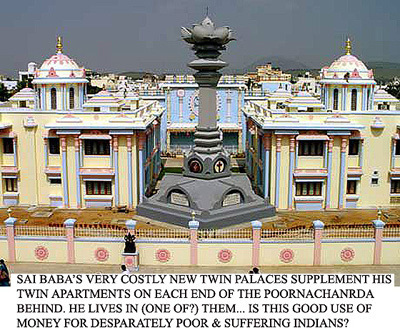 The latest palaces are very costly twin buildings opposite his twin apartments in the Poornachandra. However, he does not live in either of the two very costly museums he had built at Prashanthi Nilayam in his own honour for his self-advertisment. SSB has warned in discourses, "Properties are not proper ties". So what about "His only Property", the boys? Are they proper ties? Is he a slave-owner. Well, we have already been told plenty in many testimonies about the kind of 'service' he gets from boys and young men in the interview room, not to list all those who have slept and still sleep in his bedroom. "... every one of you is living off the property of God, for does not all this belong to Him? And what do you do in reurn for all the benefits you derive from the property of the Lord? You cannot eat it and sit quiet. You must at least give some physical labour in return; he who does not work but eats is a cheat." Sathya Sai Speaks Vol.1, p.220f. This from one of the biggest property owners in India! (He says he does not own anything, but that is but a formality to avert criticism of his massive extravagence, despite his granting the use of other donations for social improvements. For example, he alone can use or dispose of about 10 luxury apartments built from devotees' donations). It is known from close servitors and close ex-devotees that most ARE luxurious inside. Convenient for him that he is the One God, "Deity of deities", who also 'owns' the entire created Universe, lock stock and barrel! Cosseted, protected by armed guards, having strolled about for constant adulation for decades, he has done nothing resembling what most people know to be real work himself, but he most certainly eats well enough. A former devotee friend of mine, Mr. V. Ramu, a vigilance officer of the Indian Administrative Service (author of the hagiographic book 'Waiting for Baba'), who attended a luncheon given for Sai Baba in Bangalore in 1996 at the house of Central Trust member, Mr. Prasad, told me that Sai ate well. I was surprised and wondered if I had heard correctly. He assured me"Swami ate heartily of all the many dishes provided, served to him by Mr. Prasad's son." This is not a thing you will hear from others who never say anything that could cast the slightest doubt on 'Swami' as being anything but a perfect renunciant, which is simply not true, neither as to food, pomp, show or his sexual satisfaction.